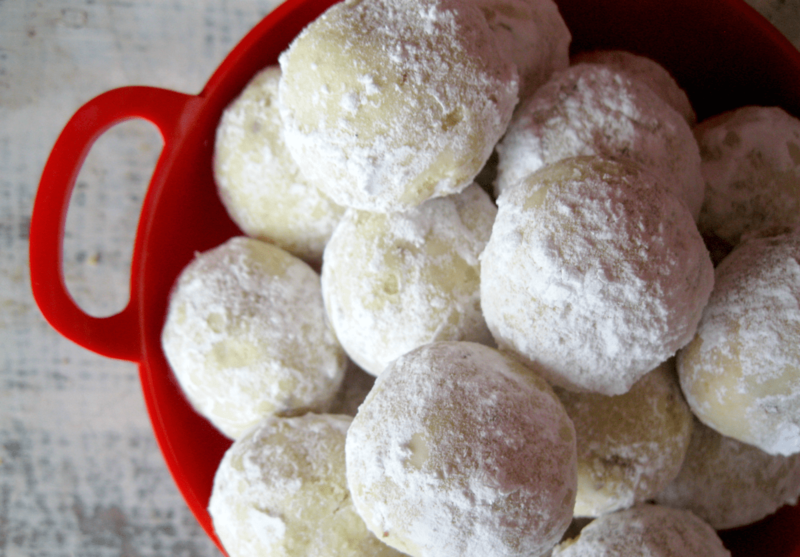 Lime snowball cookies are the perfect festive addition to your holiday dessert table! Growing up, the women on my dad’s side always got together to make Christmas cookies. It was a day full of sugar cookies + powdered sugar icing, pinwheels, mini chocolate chip cookies and powdered sugar covered snowball cookies, all beautifully arranged in Christmas themed tin boxes. We made the same four kinds of Christmas cookies every single year, which is exactly what you want with a holiday tradition—especially when you’re a kid! 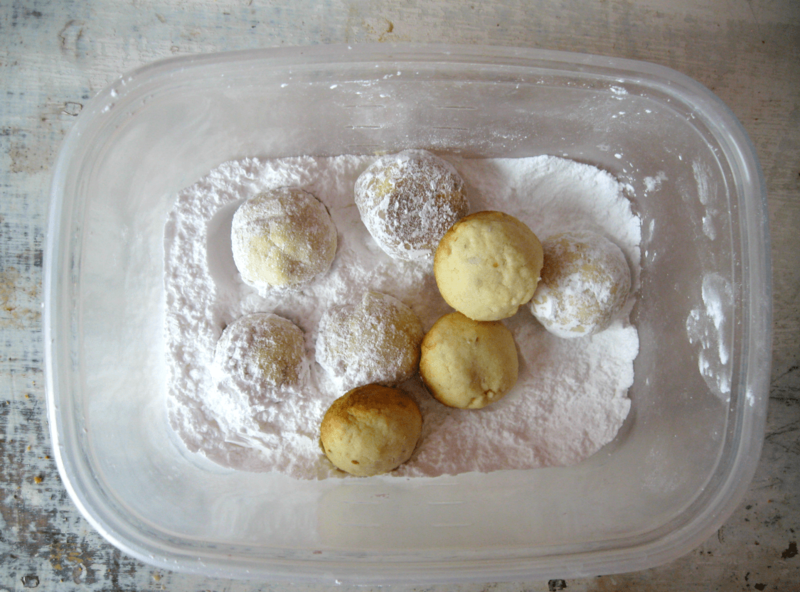 A couple years ago, I decided to make the powdered sugar coated snowball cookies, but with a twist: lime and almonds. I bought the cheapest “cut” of almond at the store, and then rough chopped before adding them to the dry ingredients. I used the zest and juice from two limes, and added them right in the dough as well. 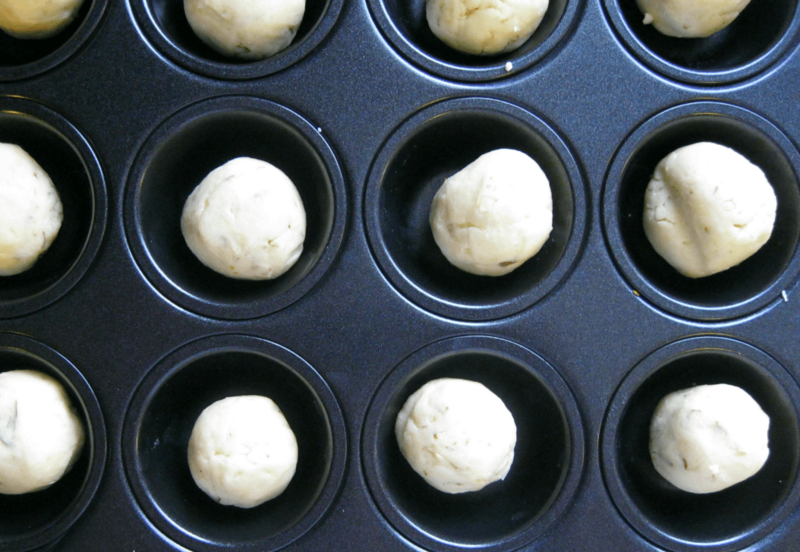 The cookie dough was rolled into 1″ balls (give or take), and then instead of using a regular baking sheet, I used my mini muffin tin. It worked perfectly, and I didn’t have to worry about the balls rolling around! Genius. Once they were done baking, I let the almond lime snowball cookies cool for about 5 minutes in the mini muffin tin. If you try removing them earlier they kind of explode, so even if you’re impatient (like me) just wait. TRUST ME. After 5 minutes, I rolled them around in powdered sugar before letting the cookies cool completely on a baking rack. Then they got one last dredge in powdered sugar. These are SO good, and such an easy Christmas cookie to start a baking tradition in your house. Happy holidays! Lime snowball cookies are the perfect addition to your holiday dessert table! 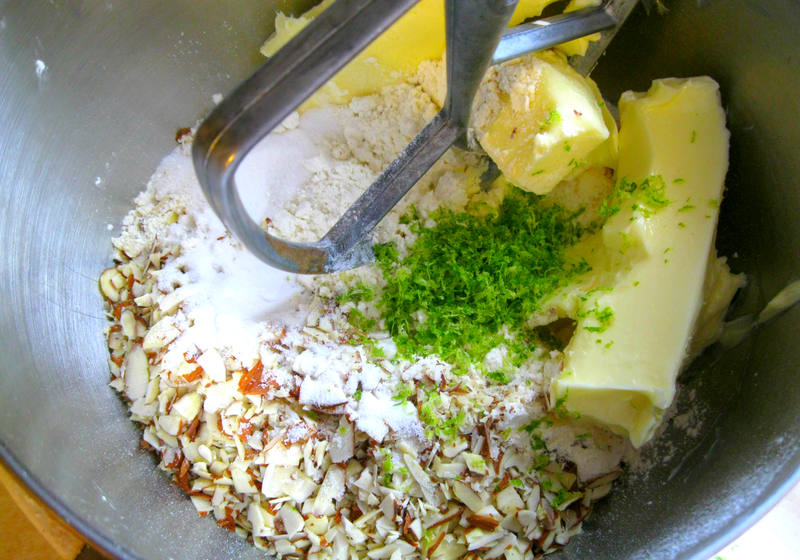 Add all the ingredients (including the lime zest/juice) EXCEPT the powdered sugar to the bowl of a standing mixer fit with a paddle attachment. Mix on low speed until a soft dough forms. Bake the almond lime snowball cookies for 18-22 minutes, or until they are lightly golden on top. Remove the pans from the oven, and let the cookies cool for 5-10 minutes before you try and take them out. Coat each almond lime snowball cookie in powdered sugar, and then set them on a baking rack to cool completely. Coat them one last time in powdered sugar. Store the lime snowball cookies in an airtight container or bag.